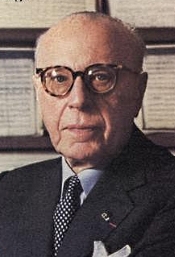 George Szell, Cleveland Orchestra and Chorus. Sony SMK 60987. With this release from the late Nineties, Sony presented a line of low-priced classical reissues in conjunction with National Public Radio's "Performance Today." 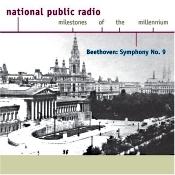 The series was called "Milestones of the Millennium," and, at least initially, it consisted mainly of collections of short works built around a central theme: "The Renaissance in Music," "Bach: The Brook and the Wellspring," that sort of thing. The first complete work Sony issued in the line was this Beethoven Ninth, and they couldn't have chosen a better representative. Hungarian-born conductor George Szell (1897-1970) recorded this Ninth for CBS at Severance Hall, Cleveland in 1961, and as such I missed it back then. Well, I was in high school at the time, so what can I say? By the time CBS re-released it on vinyl, I had come to find many CBS LPs sounded too bright, too limited in their response, and too noisy for my taste. I even bypassed the earliest CD reissue of the recording. Anyway, much of that changed with this 1999 remastering. The Szell performance is a marvel of precision and control. It is truly electric, from the opening Allegro through the final notes of the great chorus, under the direction of Chorus Master Robert Shaw, and the recording's sound quality is at least tolerable. First to the performance, where the tension never lets up, not even in the Adagio, which is supposed to be the leisurely interlude that lets us catch our breath. Instead, Szell helps the Adagio zing along at a pace that is not so much fast as it is dynamic. Then, the magnificent choral outburst that concludes and concludes and concludes the piece again is reworked with ever greater intensity, with soloists Adele Addison, Jane Hobson, Richard Lewis, and Donald Bell singing splendidly. The interpretation may not reach the heights of grandeur attained by the likes of Schmidt-Isserstedt and the Vienna Philharmonic (HDTT), Eugen Jochum and the London Symphony (EMI), Jochum and the Concertgebouw Orchestra (Philips-Belart), Georg Solti and the Chicago Symphony (Decca), or Karl Bohm and the Vienna Philharmonic (DG), but it matches and sometimes exceeds them in terms of force and concentration, and that's saying a lot. Sony's remastering used 20-bit SBM technology to obtain the best possible sound from the original source, and while it cannot measure up to some of the discs I've mentioned, it's good for its age. The Szell is a fairly close recording, a feature especially noticeable during the entrance of the soloists in the "Ode to Joy." Still, one gets used to it. Besides, the booklet note informs us that in Beethoven's day the chorus would have stood right in front of the orchestra. The sound is slightly edgy, with a degree of sheen taken off the top end, indicating some degree of noise reduction. In spite of that, however, there is a low-level tape hiss present in the background. Bass is adequate, though not particularly deep, and the loudest choral passages tend to get a little congested and distorted. Regardless, these are minor faults, and anyone who gets caught up in the performance probably wouldn't notice, audiophiles excepted. At the price, it seems definitely worth a listen.